I got this book from my uncle’s collection and remember really enjoying it despite by the time I could read it on my own, the Soviet Union was no more, making the Soviet Super Soldiers, country-less. What little kid wouldn’t like a story where the Hulk takes on a bear? Former Colonel Glenn Talbot has gone rogue! He’s defied Congressional orders and commandeered the the War Wagon, built for one purpose to destroy the Hulk. Talbot, outraged at the shutting down of the Gamma Base, has made his war on the Hulk a one-on-one battle and will commit treason in order to rid the world of the Hulk! Meanwhile, the Hulk is globe-hopping, looking for food but instead finds war. He leaps from Egypt all the way to Afghanistan which is embroiled in a war with the Soviets. Hulk encounters an Afghani soldier who does not fear the Hulk or even notice him, because he is too shell-shocked from with the Soviets have done to his village. Then, he encounters the Russian soldiers who fire on him. The Soviets mobilize their fighter jets to take out the "demon" that is protecting the Afghan village and Hulk leaps into the air to take them out and punches a hole through the back of one of the planes, shocking the Green Goliath. The pilot ejects after setting the autopilot to the Forbidden Zone, an irradiated area in the Russian tundra. As the soldiers pick up the pieces after the battle with the Hulk the War Wagon floats by, inside Glenn Talbot realizes that he’s lost the Hulk’s gamma trail and can no longer track the beast. Meanwhile in Moscow a Colonel enlists a super-team of the fifth(!) Crimson Dynamo, Vangard and Darkstar and Major Ursus. Dynamo challenges the Major Ursus to see if he’s fit to join them and gets a surprise! The dude literally poked the bear! Now that Dynamo is convinced that all the members belong on the team, the Colonel gives them their mission: The Forbidden Zone is expanding and the government is convinced that someone is making it grow and that someone is the Presence. The Presence believed dead after a battle with the Defenders. But he is alive and has moved to the Forbidden Zone with the Red Guardian. The government has left them alone, hoping that they would remain at peace, but now action is required. "Excuse me, Hulk will give you privacy!" The Hulk crashes into the Forbidden Zone and sees the Presence and Red Guardian, hands locked together and paying no attention to the monster in their midsts. 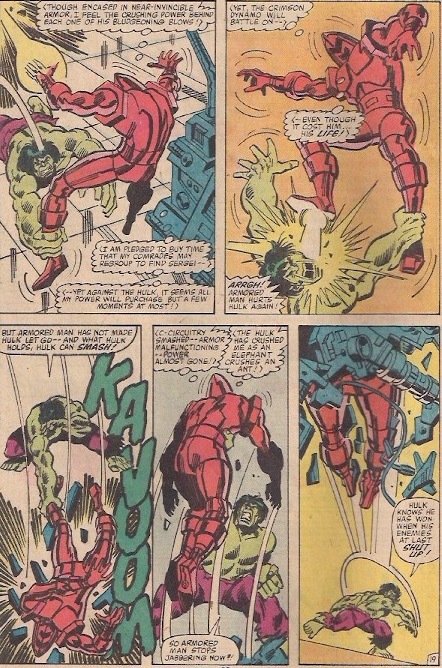 The Soviet Super Soldiers arrive and Dynamo immediately attacks the Hulk without provocation. Now the communist heroes have to battle the Hulk before attending to their mission. As Ursa Major, Dynamo, and Dark Star prepare to take on the Hulk, Vanguard is confronted figure who is responsible for this chaos. Across the world, Rick Jones enlists the help of Captain America and the Avengers to help stop Talbot from hunting down the Hulk. Cap says that they would be happy to help but not behind the Iron Curtain, the Avengers can’t risk starting an international incident, but will be happy to intervene when he re-enters the first world. Hulk continues to decimate the Super Soldiers and a fallen Darkstar is picked up by the shrouded figure. 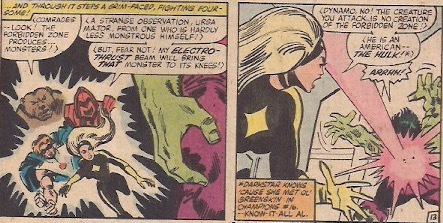 Suddenly Sergei-The Presence notices the melee and turns both Hulk and Ursa back to their original forms. I finally found a book with a Hostess ad! This was an interesting glimpse into how comics handled the cold war. The Soviet Super Soldiers were not portrayed as bad guys but as heroes (except Dynamo, who’s just a jerk) doing what they think as best for the state. This is probably reflective of the time books featuring communists in the 50s and 60s would be much more judgmental of ‘commies” than we would be in the 80s as the cold war was starting to wind down. The Afghan soldiers were portrayed as the good guys in the story, which was odd perspective from a modern reader, knowing that many of those that fought the Soviets would radicalize and become enemies of the US. Mantlo mentioning that this group had blue eyes thought be traced back to the Soldiers of Alexander the Great was a bit of odd propaganda. My favorite of the Super Soldiers is Dynamo, who’s the Guy Gardner of the group. He’s a hothead that keeps starting fights he can’t finish. He managed to piss off Ursa Major within five minutes of meeting him and attacked the Hulk before realizing he wasn’t a threat. This book also has all of my favorite elements of Hulk story, Hulk minding his business is attacked by soldiers, this time Russian soldiers, for a twist due to a reaction to the Hulk's appearance. And a giant bear putting Hulk in a full nelson. Bill Mantlo was one of Marvel’s most prolific writers in the 70’s and 80’s, he made the ROM: Spaceknight series more successful than the toy line it was to promote. He even gave the world Rocket Raccoon. In 1992, he was struck by a car and left in a coma for weeks and he currently lives in an assisted living facility. As you can imagine, the bills are staggering, if you're a fan of his work and have the means please check out billmantlo.com and donate to help his family pay for the astounding medical costs. It's the Re-Collector Holiday Special! 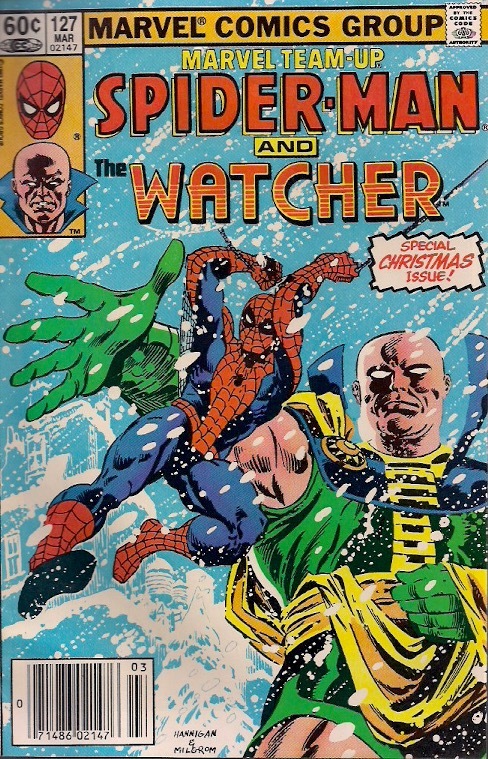 Spider-Man teams with Oatu the Watcher in a special Christmas-themed Marvel Team-Up #127 by J.M. DeMatteis and Kerry Gammill! See you next week!